Pizza Pub Snack Mix – This is a savory pub snack mix with influences of pizza flavors using pepperoni bits, mozzarella cheese sticks, pretzels and cheese crackers. 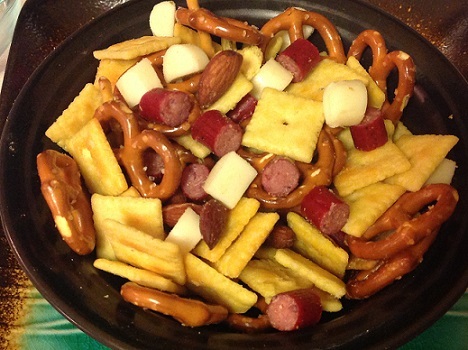 A great salty snack mix to serve while watching a sports game and enjoying a cold beer. I put this together when I was looking for an easy snack to make with some extra pepperoni sticks which go really well with cheese. I added the crunch with the cheese crackers and pretzels and this ended up being a hit with my husband who loves to snack on cheese and crackers. In a large serving bowl, combine the Cheez-It crackers, pepperoni chunks, pretzel, and almonds. Add the mozzarella cheese chunks just before serving. Storage: Store in an airtight container or a resealable plastic bag. Keep the mozzarella cheese refrigerated. Do not add the cheese until just before you are ready to serve.